The Federal Government has resurrected Matthew Guy’s plan to ease McGregor Road’s traffic bottleneck. On Thursday, Minister for Cities, Urban Infrastructure and Population Alan Tudge and Latrobe MP Jason Wood announced a $13 million investment to “bust congestion” on the jam-packed thoroughfare. 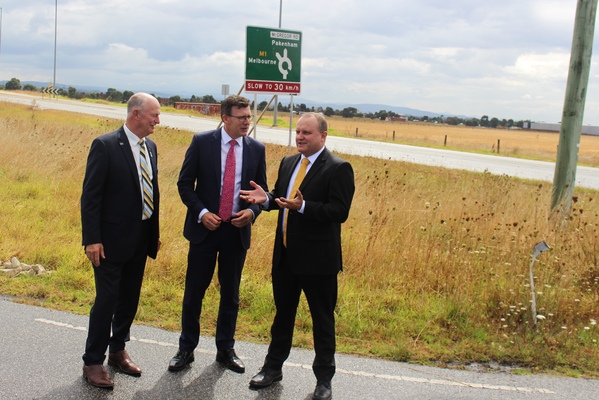 A McGregor Road interchagnge will be developed, with new ramps at the Pakenham Bypass – regardless of which party triumphs in this year’s federal election. It will include an extra lane on the Princes Freeway off-ramp to McGregor Road and converting the road’s single lane to a dual lane leading from the freeway. A similar project was pledged by the State Opposition last year if it were to seize victory. 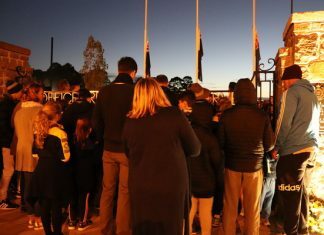 It comes six months after Prime Minister Scott Morrison travelled to McGregor Road to witness Pakenham’s peak-hour crush. Since then, the Labor State Government has committed to remove Pakenham’s four level crossings with a Skyrail by 2025. Mr Tudge, a former Pakenham local, said the McGregor Road project is well overdue. “I grew up in Pakenham and I’ve seen it grow so rapidly over the years. “This has been so important to get achieved, for those additional on and off ramps heading eastbound. The Minister said the project would not have been possible without Mr Wood’s advocacy. The Latrobe MP said that with McGregor Road and eight intersections between Beaconsfield and Pakenham now funded, he will turn his attention to Bald Hill Road and Racecourse Road. “The biggest complaints we’ve had is regarding McGregor Road, Bald Hill Road and Racecourse Road,” Mr Wood said. “It’s about connecting people in this fast growing area to the Monash Freeway and making it safe. The announcement was well received by Cardinia Shire’s Mayor, Graeme Moore. “It’s all about our community and they’re sick to death of waiting for something to happen and I think this is going to achieve a big result,” he said.